Sun Tanning is a natural defensive mechanism of our body against harmful UV Sun rays. During this defensive process our body increase the production of melanin pigment that protect the body from harmful effects of UV Sun rays but unfortunately also give your skin dark complexion. Make a paste by mixing 1 tablespoon of milk powder, 1 tablespoon of honey, 1 tablespoon of lemon juice, and half tablespoon of almond oil. Apply this paste on your face and wash off after 10-15 minutes. This remedy not only removes tan but also gives smooth and glowing complexion. Apply a paste of fresh ground mint leaves and leave it for about 15-20 minutes. Wash with cold water. Regular application for two weeks will show good results. Application of cucumber juice is also considered very effective for removal of tanned skin. For best results, repeat this process on a daily basis. Apply a mixture of grated tomato with 2-3 drops of lime juice on the face. Leave it for 15-20 minutes before washing off. For Best results repeat this application at least for 15 days. Make a paste by mixing Oatmeal with curd and tomato juice. Apply this on your face and neck for 15-20 minutes.This remedy not only remove tan but also lightens the skin. Lemon is a natural bleaching agent and can help remove the tan from your face. Lemon contains ascorbic acid due to which it can easily bleach tanned skin. Simply squeeze a lemon into a dish. Soak a cotton ball into the lemon juice and apply it all over your face and neck. Lemon is also considered best to give you glowing skin. Although Lemon is supposed to be a natural bleach but be aware that it dries the face. That`s why, don't forget to apply a good moisturizer after washing off lemon. Don't go out in sun, before washing lemon juice. Dry some orange peels. Then, mix them to a bowl of curd. This would be beneficial for removing tan. Keep this for about 15 minutes and wash off with cold water. Soak four almonds overnight. In the morning remove their skin and grind them fine and make a paste by adding one teaspoon of milk and 3-4 drops of lime juice. Apply it on your face and neck and leave it overnight. Wash with cold water in the morning. Regular application for 15 days will show you good results. Grind potato to make a fine thick paste. Add some lemon juice to it. Apply it on the affected areas like face and neck. Leave on at least for 15 to 20 minutes until it dry. Then wash with cold water. For Best results repeat this remedy twice in a week. Milk also helps to make your skin smooth and lighten the dark skin. Regular application of raw milk over tanned surface will show you the difference after few days. 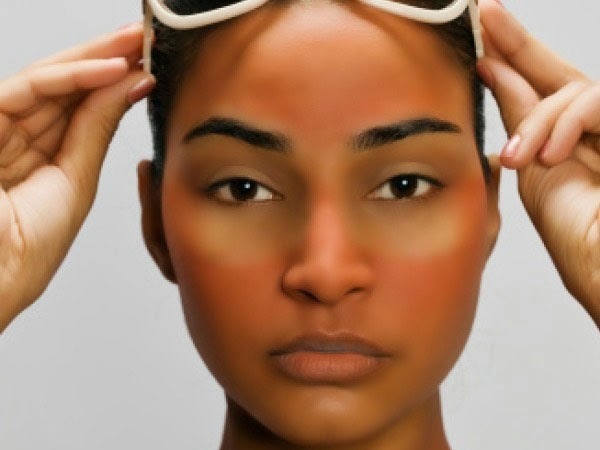 For Sun Tanned Oily skin, make sandalwood paste with some milk and little turmeric(haldi) and apply it on the sun tanned skin.After 15 minutes remove this with fresh water. Mashed papaya helps to lighten the dark tanned skin. Prepare a mixture by mixing pulp of papaya with some honey. Apply it on your face and neck.After 15 minutes wash it off with fresh water. Mash few Aloe Vera leaves and add 1 Lemon juice to it. Apply this mixture on the affected areas.After 15 minutes wash it off with fresh water.This remedy is considered very effective for removal of sun tan. Make a paste by mixing 2 tablespoon of honey and 1 lime juice. Mix them well and apply it on the affected area. This is very effective in lightening the tanned skin. (i)Avoid direct exposure to sun rays. (ii)Apply a good sun screen lotion before you go out in the sun to protect your skin from sun tanning and harmful UV rays. (iii)Daily drink at least 10 to 12 glasses of water to hydrate your skin and keep it blemish free. (iv)Eat healthy diet and increase intake of Vitamins A,C and E because these Vitamins are considered best for young, smooth and glowing skin.